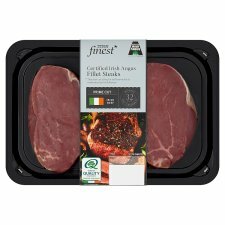 Certified Irish Angus beef fillet steak. Matured for 30 days for succulence and rich flavour. One of the most tender cuts, from Irish beef. Suitable for home freezing. Ideally use as soon as possible after purchase but always use the 'Use By' date shown. Lightly brush each side of the steak with a little oil and season with sea salt and freshly ground black pepper. Heat a heavy based frying pan over a high heat until smoking. Add steak to the dry pan and cook over a high heat for 1 minutes on each side. Reduce to a medium heat and continue to cook for a further 4-6minutes (rare), 6-8 minutes (medium) or 8-10 minutes (well done), turning once halfway through cooking time. Remove steak from the pan and allow to rest in a warm place for 3-5 minutes before serving.